I offer a friendly and welcoming Bespoke Framing Service to Fine Art Trade Guild commended and conservation standard for your art, photography, embroidery, memorabilia and and just about anything else, within reasonable limits of course! For items that are valuable to you, whether precious sentimental pieces or just worth a lot, we use certified conservation materials that'll protect them into the future. 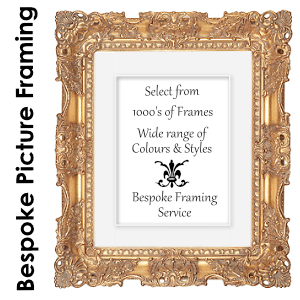 There's thousands of frame types to choose from and I get regular deliveries so they are available when required. I build your frame by hand to order so it'll fit perfectly into your home or office. Preverving memorabilia is an important part of the framing I do at dragonly Framing. Wether it's of historical importance or a cherished keepsake the materials and techniqes used are the key to the conservation of these precious objects. The techniques used must conform to strict standards and be full reversible so that if in 20 years the items is removed from its frame it would be in same condition it was in when it was framed. The materials used are pH neutral and made from higher quality raw materials, thus helping to conserve the garments or objects within the frame. 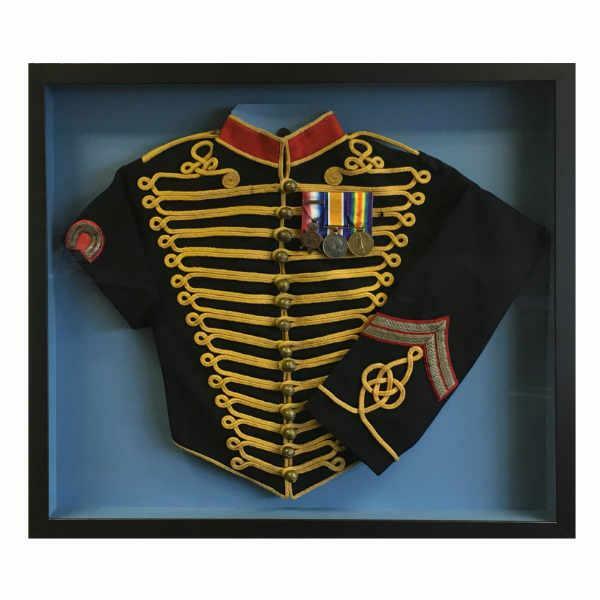 A recent example was a WW1 dress uniform with a fasinating story and history. The garment was over 100 years old so a lot of care was taken to choose the right materials and tehniques and to present the finished frame in a visually appealing way. The piece was further enhanced with the choice of glass used, choosing to go with a UV protection glass with anti-reflective properties. UV protection helps protect the fabric from harmful UV light, whilst the anti-reflective coating enhances the veiwing pleasure. Museum Level Framing is not confined to museums’ works. Some artwork gains museum-quality status over time. Works that are to be preserved for future generations, including high value items and artwork of potential or historical value should be framed to Museum Level, where possible. Processes are intended to be fully reversible up to 35 years, which means that the framed work can be returned to its former state, i.e. prior to framing, at any time, assuming that the artwork is not inherently unstable. Objects and artworks that are to be preserved for future generations and collectables should be framed to Conservation Level, if not to Museum Level. Original artwork deserves Conservation or Museum Level Framing. Limited edition prints of moderate to high value that are not framed to Conservation or Museum Level may not hold or increase their value over time as well as those that are. This is because Conservation Level framing, as well as Museum Level framing, requires that all processes affecting the artwork be fully reversible. In other words, what you have framed to Guild Conservation Level can be returned to its former state, i.e. prior to framing, at any time up to 20 years, assuming that the artwork is not inherently unstable. Guild Commended Level framing should visually enhance the artwork and will give a moderate level of protection from physical and mechanical damage, airborne pollution and acid damage. A window mount or slip should normally be used to visually enhance the artwork and distance it from the glazing. Processes do not have to be reversible so make sure your framer knows if the chance to get your work back to its condition prior to framing is important to you. The Guild recommends that processes should be reversible whenever possible, as the future value of works cannot always be foreseen and work ‘in mint condition’ commands the best secondary market value. Because that is the best you can afford! It’s better than Minimum and better than readymade framing. 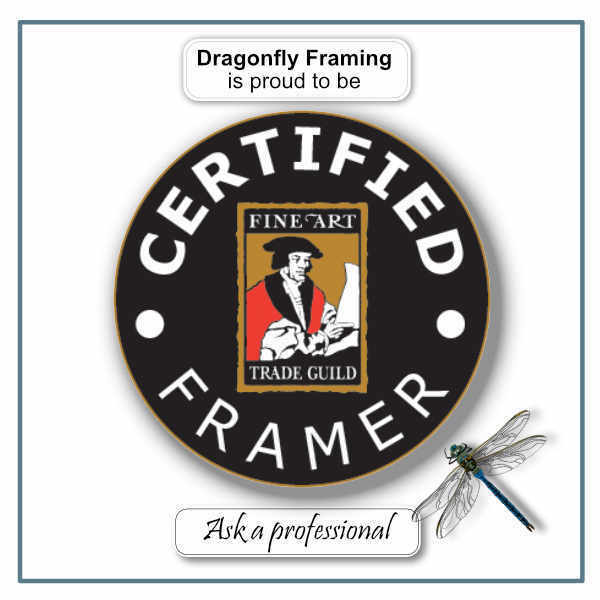 If you can afford to frame your items or artwork at Commended Level, the Fine Art Trade Guild recommends you do so, as that gives it a degree of protection from physical and mechanical damage, airborne pollution and acid damage. I don't recommend this level! Complement your frame with a creative mount, add your choice of glass.